Cast: Felicity Huffman, Kevin Zegers, Fionnula Flanagan, Graham Greene. Story: A trans-sexual discovers a son. Transamerica would be a wholly unremarkable film but for one thing: the utterly stunning performance by Felicity Huffman in the lead role. 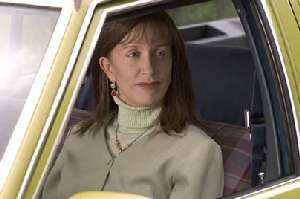 Huffman, previously known only as the overwrought mother in Desperate Housewives, plays Bree, a man waiting for transgender surgery to make him a her. This would be a difficult enough part for a man to play, let alone a woman, but she pulls it off (as it were) with such magnificent results that it makes you wonder if the Oscar panel even saw it before awarding the gong to Reese Witherspoon. The finesse with which Huffman portrays a man trying to portray a woman is fascinating to watch - it's one of the all-time best performances by anyone. Transamerica is essentially a road movie, with Huffman travelling across the country with his/her newly-discovered son from his "experimental" years. Along the way he deals with the everyday trials he's come to live with and visits the family, including disapproving mum Fionnula Flanagan (from Four Brothers). It's these scenes that highlight just how difficult Bree's life is, but if anything the meaning is overshadowed by the spellbinding compulsion to watch Huffman being a man better than any man could. Transamerica is an average road movie made unmissable by a breathtakingly convincing central performance. All drama students should watch it until they know it by heart and the Academy need shooting for letting its rightful statuette go to someone far less deserving. Testosterone Satisfaction Rating: 2/5 - rather confusingly we see Felicity Huffman's naughty bits as a man AND a woman - surely a cinematic first! To enjoy this film you should be: appreciative of great acting. Transamerica was released in the UK on 24th March.